Isidor Kaufmann, Hannah (detail), late 19th or early 20th century. Oil on panel. Charles and Lynn Schusterman Collection. Hanukkah lamp, German (Augsburg), about 1750. Silver gilt. Mizrach, printed by Emile Simon, fils, about 1840. Lithograph, hand-colored. Gift of Rabbi Howard A. Berman. Made by Porcelain Claw Factory, Passover plate, Dutch (Delft), 18th century. Tin-glazed earthenware. Charles and Lynn Schusterman Collection. The word “Judaica” describes Jewish ritual objects used in the home or in the synagogue across history, geography, and media. 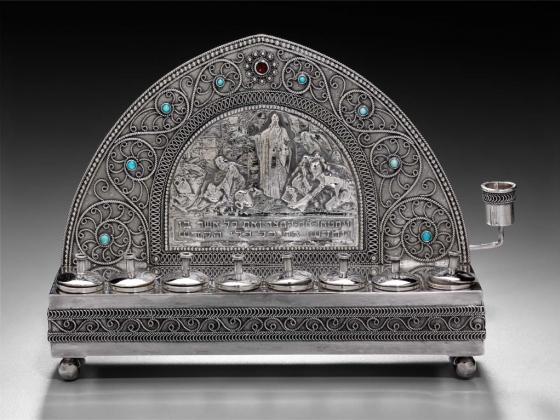 Silver finials to embellish Torah scrolls, glass kiddush cups, brass Hanukkah lamps, marriage contracts on parchment: these are only some of the diverse works under the wide umbrella of Judaica. While more specifically titled “Hebraica,” books and manuscripts such as bibles, prayer books, and writings on Jewish law were also created for Jewish religious practice and may also be considered Judaica. To that, we add works—from paintings and sculpture to postcards and ancient coins—that are in some way an expression of the Jewish experience, history, and culture. Judaica is one of the newest areas of collecting at the MFA. This interest was greatly encouraged by the generous gift made in 2013 by the Charles and Lynn Schusterman Collection of more than one hundred objects. Prior to this donation, the MFA owned only a small number of items, such as a shofar, a Torah binder, and a magnificent German Hanukkah lamp. Since then, the MFA has embarked on an exciting program of acquisitions, with the goal of pursuing objects of the highest artistic quality while representing the richness and diversity of Jewish culture across time and place. Judaica objects are displayed in a number of MFA galleries to show the stylistic affinities with the surrounding culture: in the Angelica Lloyd Russell Gallery, 142, devoted to 18th-century European decorative arts, are Hanukkah lamps, spice towers, Sabbath candlesticks, and ceramics plates for the festivals of Passover and Shavuot. In the Musical Instruments Gallery, 103, is a Polish shofar, the ram’s horn trumpet used during the high holidays; in the Daphne and Peter Farago Gallery, 258, are original takes on Judaica by contemporary artists. The Art of the Americas Wing hosts Jewish ceremonial art, with striking modernist candlesticks shown in the 1940s and 1950s Gallery, 336. Works are always being added in the galleries to ensure that the MFA’s history of world art features the best of Jewish art. Judaica objects are displayed in a number of galleries throughout the Museum. Stop by the Sharf Visitor Center to pick up a list of Judaica objects on view. This gift highlights three centuries of Jewish decorative arts and ritual objects, ranging from Hanukkah lamps to embroidered silk.